As I’m an avid fan of “post your desk topics \ workspace ” forum threads, I thought it might be nice to publish a blog article about my own workspace. I always love to see how other people design their work environment and how they customize furniture to suit their needs. Hopefully you can find some inspiration in mine. Last year I decided to refurbish my home office. To create a space that enables me to do my work in the most optimum way, and of course that is pleasing to the eye. The first thing that came to mind was a whiteboard and a really big one. So I needed to build a wall to hang the whiteboard, as the room didn’t had any wall that could hold a whiteboard big enough. After completion of the wall, a 6 x 3 feet wide whiteboard found its way to my office. Although its roughly 5 to 6 feet away from my desk, I realized I didn’t use it enough due to distance. Sitting behind the desk while on the phone or just using my computer, I found myself scribbling on pieces of paper instead of getting out of my chair and walk over to the whiteboard. Therefor I needed a small whiteboard I could grab and use at my desk. It seemed reasonable, however I like minimalistic designs where clutter is removed as much as possible. I needed to come up with something different; enter the whiteboard desk! Instead of buying a mini whiteboard that needs to be stored when not used, I decided to visit my local IKEA and see what’s available. Besides “show your desk” threads I hit ikeahackers.net on a daily basis. While looking at tables, I noticed that the IKEA kitchen department sells customized tabletops. Each dimension is possible in almost every shape. I decided to order a 7 feet by 3 feet high-gloss white tabletop with a stainless steel edge. The Ikea employee asked where to put the sink, she was surprised when I told her that the tabletop was going to function as a desk. I chose to order the 2 inch thick tabletop as I need to have a desktop that is sturdy enough to hold the weight of a 27” I-mac and a 30” TFT screen. The stainless steel edge fits snug around the desk and covers each side; it doesn’t stick out and is not noticeable when typing. It looks fantastic! However the downside is the price, it was more expensive than the tabletop itself. The alternative is a laminate cover that looks like it will be worn out easily. While spending most of my time behind my desk I thought it was worth the investment of buying the real thing. 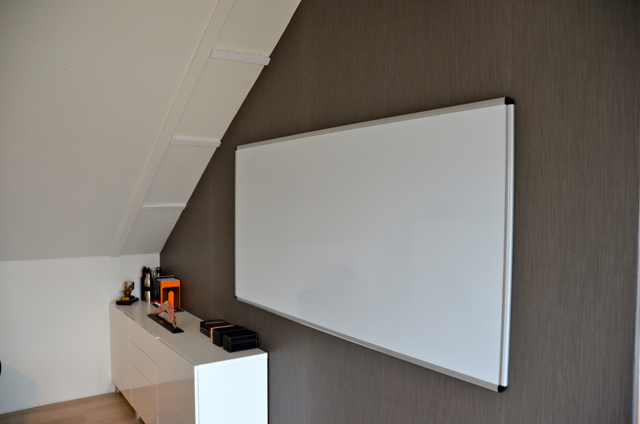 The high-gloss finish acts as the whiteboard surface and works like a charm with any whiteboard markers. I left notes on my desk for multiple days and could be removed without leaving a trace. 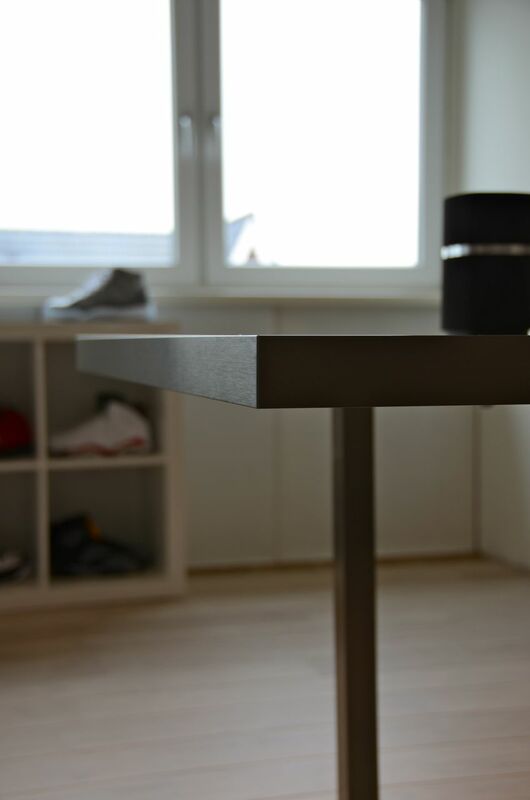 The tabletop rest on two IKEA Vika Moliden stands, due to the cast of the shadow its very difficult to notice that the color of the stands do not exactly match the color as the stainless steel edge. It would be awesome to see what your workspace looks like. 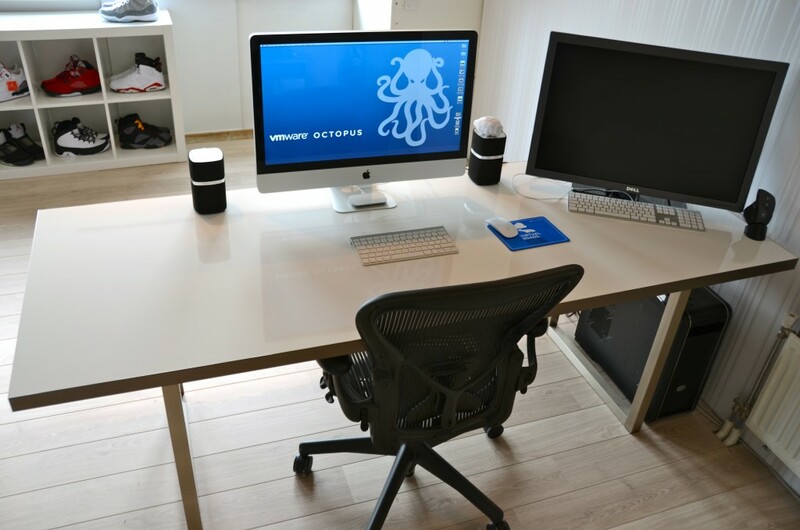 What do you love about your workspace and maybe show your own customizations? I would love to see blogs articles pop up describing the workspace of bloggers. Please post a link to your blog article in the comment section. NICE! I enjoy the brightness of the room, I remember the pictures- you remolded the entire room yourself, right? How great that must be to know you did it all. Thanks. I love the brightness, it gives me energy and clarity. Still not finished though, but it’s getting completed at a steady rate. Nice! Especially the whiteboard desk is a great idea. But I miss the lab environment. Great Idea! I may just have to steal it when i outgrow my current desk. Love the Herman Miller Aeron Chairs too! Very nice, Frank! I love the idea of combining your whiteboard and desk. I personally find it helpful (usually) to get up and go to the whiteboard; somehow, the act of getting up and moving to the whiteboard helps me clear my thoughts. Still, the most important thing is finding the right solution for your own workflow, which is exactly what you’ve done. Keep posting this sort of stuff! Forget about the desk! Let’s see them Air runners..
Great looking desk Frank. I think I’d like a whiteboard desk (if for no other reason to get rid of the paper), but like Scott, I also like getting up. Frankster, I LOVE this!! I am just about to start working more from home and I will be looking to build myself a home office. I think the whiteboard desk is an awesome idea!! I also find that once I’m at a desk, I very rarely move even if it is only 6 feet to the whiteboard. How is the Herman Miller Aeron Chair? Are you happy with it? I have this chair 7 years now and it still rocks! The chair adapts to your body due to body heat, you do not feel the chair anymore after 5 minutes. Its really perfect. Buy it if you can. I’m thinking about the model that you have or the Embody. Have you sat on both? +1 for the Aeron chair – I’ve had mine for 6 years. and it was 2nd hand when I got it. Excellent chair – check eBay and you can often find a reasonably priced one if you can collect. Great idea. The next step would be a hand scanner so you can capture your scribbles digitally and upload into notes. Where can we get the great Wallpaper on your monitor? Steve I don’t know if this wallpaper is publicly available. 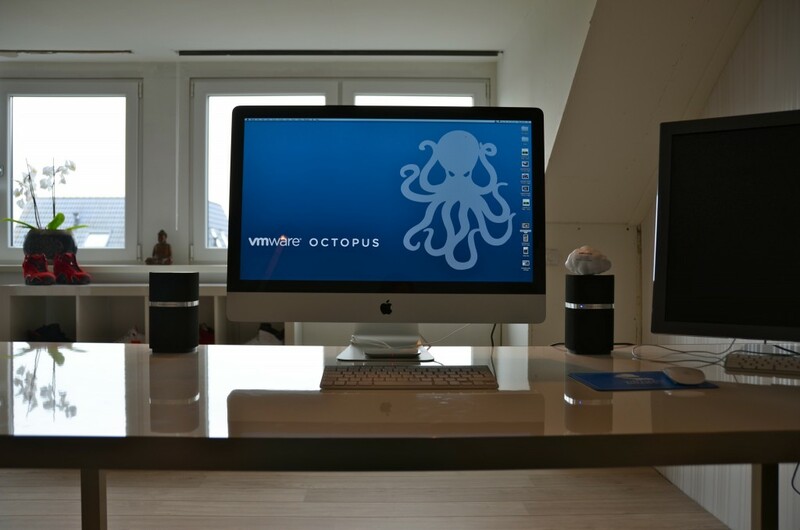 Gabe mentioned he also got the wallpaper so I assume its available when you sign up for the octopus beta. Update, Duncan shared it on Yellow-Bricks. Here’s the ultra-nerdy question – what kind of markers do you use? I thought I would also share my home office with you. +1 for the Air Jordans. Retro? Yeah, all of them. I am collecting the AJs I played on myself. Binned all OGs as they were destroyed by playing on them. Oldest Retro’s I have are the 2000 AJ V’s and VI’s. Great looking desk! What counter top did you go with? I don’t see many options online at Ikea. Hi Frank, I was just googling for “whiteboard desk” and wow, that’s an awesome desk you have there! Can you give some more information about the exact model of table top you have? Thanks. Unfortunately I do not have the product name available, but it’s just a tabletop of the IKEA kitchen line. Ah well, that’s too bad. Thanks anyway! Also, what is on the wall where there is your whiteboard? gray wallpaper? or paint? I think it was something around 350 euro’s. 330 for the tabletop, 20 euro’s for the desk stands. It works perfect, today the dpi of optical mice are so high, they can detect that they move. I use a magic mouse for the mac and a logitech for the windows machine. Both work great. Great idea this is a nice detail for business. Nice desk. I was wondering if your mouse scratches the surface? I only like glossy finishing if it stays scratchfree and well … glossy. I’ve been using it intensively for a year now and no scratches at all. The surface is extremely durable. echo all the comments about the desk. I also want to add one about your solid collection and display of Jordans (especially the Toro Bravo pack). 🙂 A follow sneakerhead! Thanks! Yeah I took the red ones out of the box, the black 5’s are actually OG’s. Hi Frank. Love this! Wondering how you went about the custom order process of the top. Who did you speak to / what did you ask for (is it counter top)? Thanks! In the Netherlands the kitchen department of the IKEA store have personel helping you design your kitchen, I assume that same concept applies to other IKEA stores in the rest of the world. I sat down with the person and I ordered the tabletop, they have a special program for the personlig kitchen table top. You can provide almost any dimension you want. During the order process she asked where the kitchen sink was placed in this top, when I told her it wasn’t for a kitchen but it served at a desk she kinda looked at me funny 😉 . Nice desk! Would never have thought to use a kitchen worktop as a whiteboard 🙂 Just one question, what’s the box under your iMac with the red light on it? It’s the Magic Mouse charger from Mobee. It’s fantastic, charges the mouse pretty quick and it serves as a great home for the mouse when I’m not using it. Where can I found one whiteboard like this ? I’m not aware that you can buy such a thing directly from a store. Can you pick where the braces go for the legs? I’m currently using a standing desk from IKEA. I used one of the table tops (around 6 feet by 3 feet) with the Vika Byske Legs, so it’s around 41″ high (adjusts by turning the legs). It does wobble a little bit, and after seeing this, I’d like to get a whiteboard. So, I’m thinking I could do a similar setup to yours, but add a third leg in the middle back part of the table to make it more stable. Thank you in advance! Great setup. Did you apply something on your tabletop, so you can write over? Or you just bought it like that? Ps : I don’t speak English very well, so excuse me for my question, if you explained it in the article. The high gloss finish of ikea is so smooth, that you can use any whiteboard marker on it. You do not have to apply anything to the tabletop, its a natural whiteboard cover. That is an amazing idea for a desk. I had one question on the price though. You mentioned the stainless steel edge was a majority of the price of the desk, how much was the stainless compared to the desk? 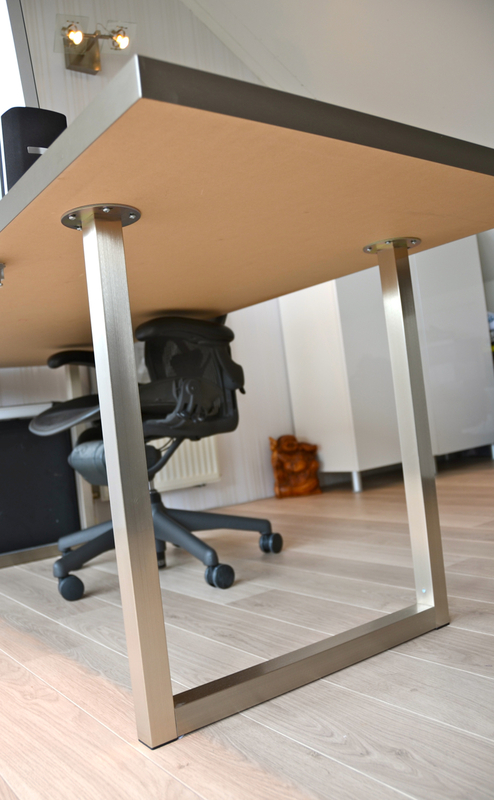 The stainless steel edge made the desk twice as expensive. But its well worth it. That surface is not the surface you want. As far as I know, IKEA only sells the smooth high gloss service in the kitchen department itself. As the tabletop is part of their “custom” line. 1. 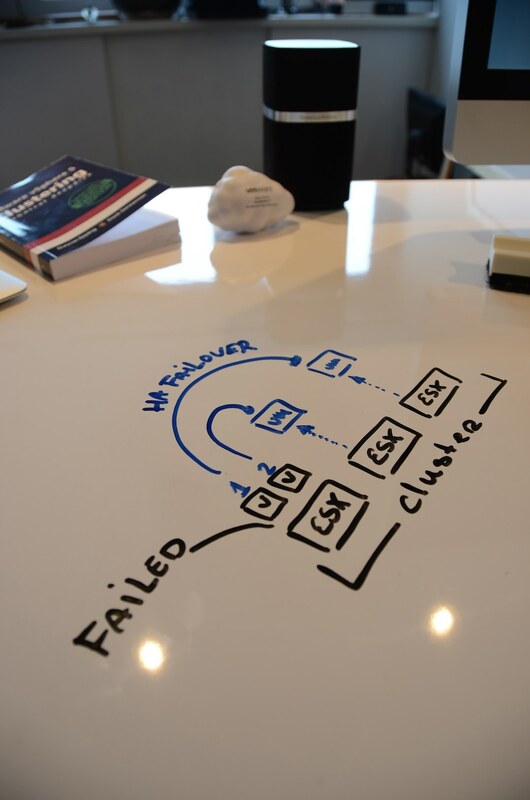 I love the whiteboard tabletop idea, and i think your office setup looks pretty ideal. 2. I am actually looking for a whiteboard like the one on your wall. Who makes it / where did you get it? Building a sound design/administration work station and this…this is something…a game chan…ITS FREAKING BRILLIANT!!! Pricing everything out today and am adding some ikea hacks of my own. I tried to do the same as you and had IKEA customize a Personlig tabletop for me. It is also the High Gloss version. However, after installing the tabletop I saw that the surface itself scratches very easily. After replacing the table once again, it is as desired. Probably a temporary production issue. I can now write on it with whiteboard markers without any problems! It it awesome… Thanks for the idea. Hi Frank – looks great! Permanent marker pro tip – if you do happen to accidentally one. Wait for it to dry and then go over it with a whiteboard marker. Wait about 20 seconds and wipe it off. The whiteboard marker breaks down the permanent marker ink and allows it to be wiped off with ease. In-case you didn’t already know.